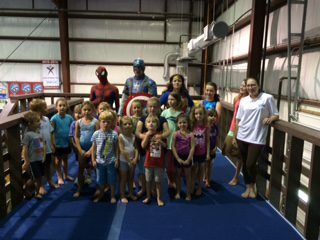 Camps are fun at Crystal Coast Gymnastics!!! Have a “NO BUMMER SUMMER” with us!!! Camps are a la carte–pay for just the days you need. Supervised late pick up available for working parents. Keeps kids active while they are having fun! 7/15-7/19 Ninja Week with Miss Sheena!! Camp Hours: 8:00-4:00. Late pick up available. Must be pre-arranged.